University of Wyoming student Jelard Aquino, from Cheyenne, received a three-month research internship with the Smithsonian Tropical Research Institute in Panama beginning in February. 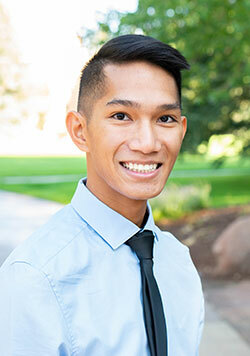 Aquino, a senior physiology major, is a McNair Scholar and National Institutes of Health (NIH) and Wyoming IDeA Networks of Biomedical Research Excellence (INBRE) Transition Fellow at UW. Aquino will conduct research with Owen McMillan and Krzysztof Kozak on butterfly speciation genomics at the Smithsonian Tropical Research Institute (STRI). He adds that while living in Maryland as a child, he explored the Smithsonian National Museum of Natural History and learned about evolutionary processes. This sparked an interest in evolution and genetics. Aquino also has a special interest in the origin of humans, and he ultimately plans to conduct biomedical genetics research for prevention of disease when he pursues his doctoral degree. The UW McNair Scholars Program provides opportunities for research and other scholarly activities, a paid summer research internship, tutoring, travel support to conferences, academic counseling and assistance in admission for enrollment in graduate programs. INBRE funding enhances biomedical research capacity, expands and strengthens the research capabilities of biomedical faculty, and provides access to biomedical resources for promising undergraduate students.